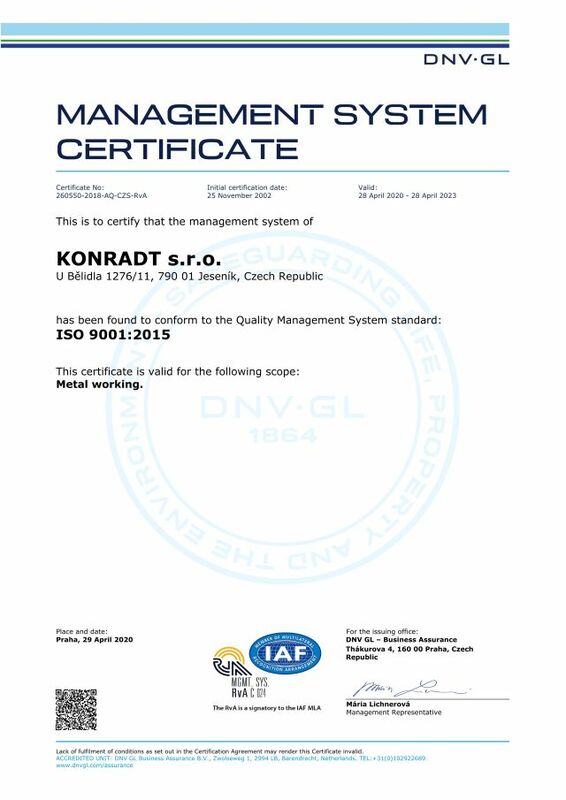 CNC Machining, Castings, Assembly Works | KONRADT s.r.o. KONRADT s.r.o. is a young business consistently specializing in manufacturing as per customer designs using efficient machinery and advanced machine tools for CNC milling and CNC turning. We also provide assembly works including the completion and delivery of functional units, including machined and pre-assembled castings. We are able to provide our customers with further services in the area of metal processing. Send us your requirements in the form of an enquiry. KONRADT s.r.o can also be your supplier of CNC machining. The company holds the quality management certificate according to ISO 9001:2015 standard. KONRADT s.r.o. has high-performance CNC turning machines and advanced machining tools available, thus offering a wide range of manufacture from the simplest turned parts to the machining of articulate shafts and other complex rotating parts. Customers are offered the possibility of turning steel of common grades, hardened tool steel, cast iron, non-ferrous metals and alloys, including the machining of castings, whose production is provided in co-operation with important foundries with many years of experience and manufacturing tradition. Contact us for the elaboration of a specific quotation.